The 4Runner Rooofrac Full is a modular, adjustable, and completely bolt together full length roof rack for 2010-2018 Toyota 4Runner. 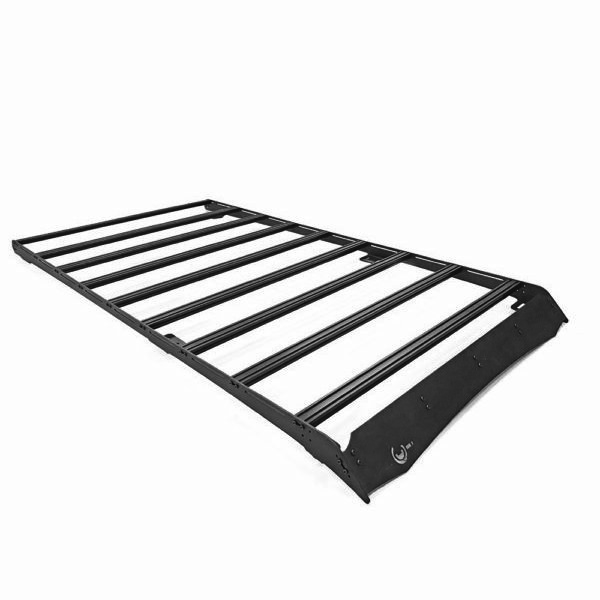 The rack consists of 2 laser cut side rails constructed of 1/4″ 5052 aluminum plate. These rails have mounting tabs on each side that will allow you to bolt the rack into the factory mounting holes and one plusnut. This Roof rack does not require drilling and has a 2 week lead time. All roof rack orders come with a free YotaMafia swag pack as well. The crossbars are made from a 1″ x 2″ aluminum extrusion that have 2 top facing T-slot channel, a fore and aft channel and 2 bottom facing channels. This offers numerous solutions for tie down options, cargo security, and the addition of accessories such as tool mounts or lighting. The rack comes shipped in a black powdercoat and black anodized crossbars. All assembly hardware comes in a black zinc finish so as to match a black paint or powdercoat finish on the final product. All mounting hardware is either stainless steel or high quality zinc plated. The rack also includes a 1/8″ 5052 aluminum plate wind deflector to help with aeroodynamics and prevent wind noise.